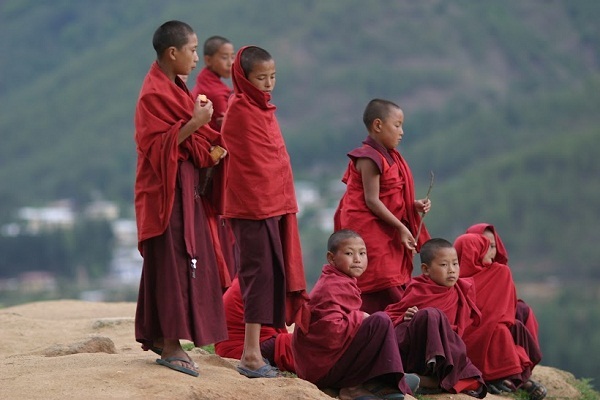 Bhutan is a land of respite in a world driven by material pursuit and economic gains. The tiny Himalayan nation wedged between China and India can be described as the ultimate travel destination where nature has remained intact and where money is secondary to happiness. Bhutan is often considered as one of the youngest democratic country when it peacefully transited to a constitutional monarchy through a Royal Command in 2008. The country was ruled by the Wangchuck dynasty since 1907. Perched in the Himalayas, Bhutan has one of the highest unclimbed mountain peaks in the world. The mountains that feed the rivers has been tapped to generate electricity that earn the major portion of the government’s revenue. But the main thrust of governance has been in providing happiness to the people rather than economic growth. Gross National Happiness, propounded by the fourth king Jigme Singye Wangchuck remains central to any government policies, plans and programs. As the mighty Himalayan range descends towards the central and the southern region of the country, one can behold picturesque river valleys, lush green hills and meadows and clean fresh rivers and streams. 72 percent of Bhutan’s land area is covered by natural forest. Bhutan’s lush green forest has thousands of species of birds, animals, plants and flowers. A major treat for travelers to Bhutan has been the experience of breathing unpolluted and clean fresh air. The valleys and hilltops are dotted with ancient monasteries and forts, known as dzongs that has fascinated traveler for many years. Many forts and temples are precariously located on cliffs and the summit of hills. Bhutan’s culture has remained vibrant throughout history. Preservation of culture has been identified as an important pillar that supports the realization of gross national happiness. Bhutanese men wear the traditional dress called Gho that closely resemble the Scottish kilt and women wear Kira, an ankle length wraparound skirt. All office goers wear the traditional dress. Culture in Bhutan, while being deeply entwined with religion, manifests itself in a vast interweave of traditional arts, architecture, festivals and religious ceremonies. Bhutan’s culture remains vibrant amidst modernization attracting tourists from all over the world. 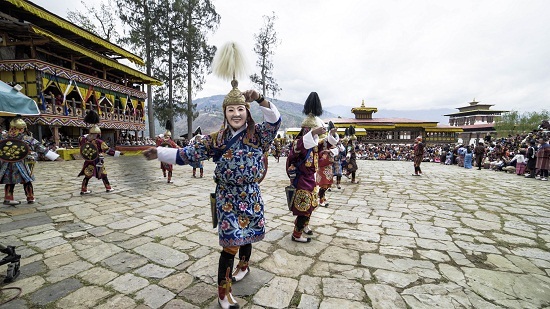 The Thimphu tshechu (festival of mask dances) alone has been attracting thousands of visitors. Tshechus are the most important festival where both culture and religion come alive. 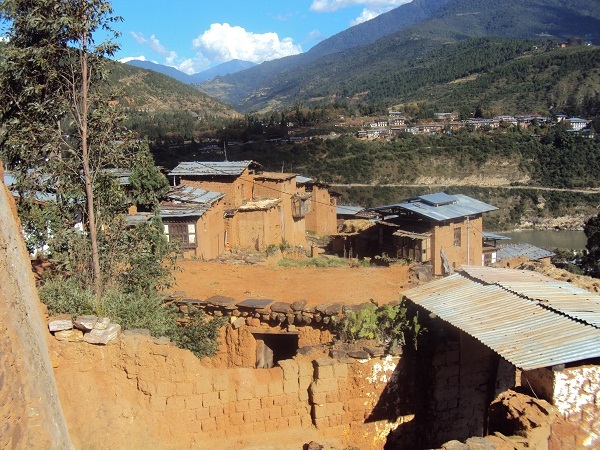 It is observed in all the districts and villages across Bhutan. Festivals and religious ceremonies can be an important place to understand Bhutan’s culture as it sees people from all walks of life dressed in traditional attire. During tshechus, monks and laymen perform mask dances and women sing wearing traditional hand woven brocades. Bhutanese arts, paintings and architecture take inspiration from nature and the Himalayan landscape. Mountains and valleys are witnessed in almost all forms of Bhutanese paintings. Traditional songs trace the meandering rivers and the ups and lows of mountains and valleys. Traditional culture and etiquette remain important in the Bhutanese lifestyle. Every office goer wears the traditional dress, while Driglam Namzha, the code for good discipline and etiquette guides every individual. 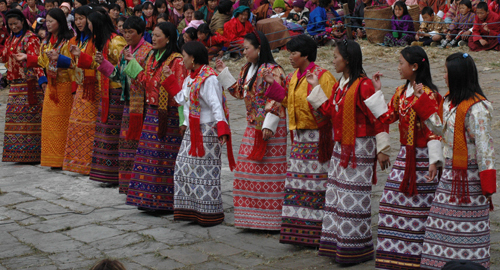 The traditional dress for Bhutanese men is the gho, which is a wraparound skirt tied at the waist with a belt while women wear kira which are ankle length skirts. Culture in Bhutan can also be witnessed in the several dzongs or fortresses, monasteries and stupas that dot the country. Bhutanese hoist prayer flags on hilltops and bridges. It is believed the wind will carry the mantras imprinted on the prayer flags across the universe and benefit all sentient beings. Bhutanese in general are deeply religious people. The basic Buddhist belief of compassion and interdependence has allowed a society where people live in respect of his environment that constitute not only other people, but also all other living beings. Buddhism came to Bhutan around the eighth century when Guru Padmasambhava, the great tantric Buddhist master visited Bhutan to subdue evil spirit and liberate human beings from demons. Guru Padmasambhava, who had earned the peoples’ faith by vanquishing evil spirits, taught Buddhism in Bhutan. Today, many important temples and monasteries in the country are dedicated to the life and work of Guru Padmasambhava. Buddhism had however, already become popular in India when a royal prince, Siddhartha achieved enlightenment by meditating on human life, suffering, disease, old age and death. Siddhartha abandoned his wife and son, wealth and princely luxury and set upon the task to lift the curse of sickness, old age and death by meditating more than six years. When he had found the answers, Siddhartha is said to have achieved enlightenment. Siddhartha’s teaching has since then evolved into Buddhism, crafted and molded by many of his followers and disciples. Siddhartha, who later came to be called Lord Buddha is said to have taught anyone who came to him. His teachings constituted compassion, emptiness, interdependence, impermanence and the abstinence of desire, which he had identified as the root cause of suffering. Today Buddhism is recognized as the state religion, while allowing a secular system for people to practice other religions too. The chief abbot, the Je Khenpo overlooks the spiritual aspect of the country. Zhabdrung Ngawang Namgyel instituted the dual system of governance, which include the secular and the spiritual in the 17th century. The secular looked after civil administration and politics while the spiritual handled religious affairs of the country. Starting in the northern highlands, Bhutan’s geography is roughly divided into four vegetation zones including alpine, sub alpine, temperate and subtropical. 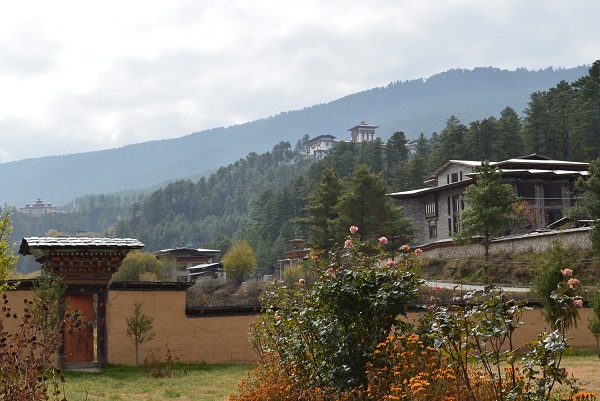 The national biodiversity centre based in Thimphu has identified over 6,000 flowering plants, 200 medicinal plants, 369 orchids and 400 species of ferns. Most of the medicinal plants grow in the alpine region in the north along with many other shrubs, grasses and herbs. Various Rhododendron species grow in plenty in both the alpine and temperate region. 46 species of rhododendron has been recorded so far in the country, of which 4 species are endemic to Bhutan. Several other flowers including the national flower, the Blue Poppy grow in the alpine region. Bhutan is rich in forest ecosystem as it covers over 70 percent of the total land area. The national tree, the cypress, which is evergreen, grow in all parts of the country and is used to make incense sticks and is considered sacred. The black-necked cranes migrate to Bhutan’s temperate forest from Tibet during winter. The mountains further north, are inhabited by the elusive snow leopard. Bhutan’s forest is home to a diverse species of rare and endangered animals. The rare golden langur lives and thrives in the temperate and subtropical region in central Bhutan. Elephants and rhinoceros can be seen in the warm and hot southern region. The Takin is Bhutan’s national animal and it inhabits the northern region. There are over 100 mammals recorded in the country so far. Bhutan is home to a variety of bird species and in recent times bird watching and photography has become a popular recreation and profession for many tourists and locals alike. Bhutan’s river system and lakes has also allowed many bird species to thrive including cormorants, king fishers, egrets and herons. Till date over 90 species of fishes have been recorded in Bhutan’s river system and lakes. Bhutan boasts of having around 30 white belied heron out of the total 200 that live in other parts of the world. Much of Bhutan’s history is obscure, but it can be broadly summarized into three important eras: the advent of Buddhism, Zhabdrung Ngawang Namgyel’s unification of the country and the institution of monarchy in 1907. Before Buddhism arrived in the country, Bhutan is said to have been in a dark age with rampant evil, cannibalism and bon practice. Guru Padmasambhava who visited Bhutan on several occasions introduced Buddhism in the country. In one occasion, guru Padmasambhava visited eastern Bhutan in pursuit of an evil spirit who fled from Tibet escaping the Guru’s wrath. Guru Padmasambhava subdued the evil spirit and blessed the site. Today it is an important pilgrimage site for every Bhutanese. Bhutan’s ancient history abounds in Guru Rinpoche’s literature. Until seventeenth century, Bhutan was divided among numerous warlords and rival factions. There were no laws and the country remained in anarchy. Zhabdrung Ngawang Namgyel who visited Bhutan from Tibet is said to have unified the country together under a uniform law. He also introduced the dual system of governance, the spiritual and the secular that is still in existence today. He was also responsible for warding off several Tibetan invasions. After the death of Zhabdrung, which remained secret for a long time, the country once again plunged into fighting, rivalry and lawlessness. It continued until Ugyen Wangchuck, the first king of Bhutan, united the country once again. Ugyen Wangchuck was officially declared the first king of Bhutan in 1907. The coronation of the fifth king of Bhutan, Jigme Khesar Namgyel Wangchuck took place in Thimphu in 2008. In the same year, the fourth king, Jigme Singye Wangchuck transferred power to the people by instituting democracy. Today, Bhutan is a constitutional monarchy with a ruling party, the opposition, and the national council, an independent house of review. The monarchy is the head of state. Bhutan’s finest architecture can be seen in dzongs perched on hilltops, monasteries on cliffs, temples and Stupas that are built across the country. Dzongs were mostly built during the 17th century when Zhabdrung Ngawang Namgyel was in the process of unifying the country under one law. Dzongs served as fortresses as it was strategically built on hilltops overlooking the valley. Dzongs became necessary to protect the country with several invasions from the north, mostly from the Tibetans and the Mongols. Punakha dzong in western Bhutan is considered an architectural marvel and attracts many visitors every day. The dzong is built between two rivers that surround it and join together. The rivers served the purpose of a moat. 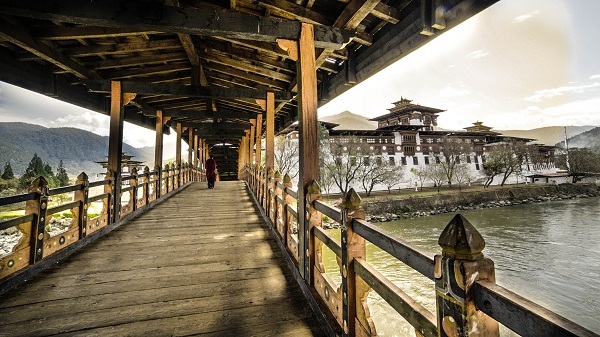 A traditional cantilever bridge connects the dzong with the road. According to legend, Punakha dzong was built from the architect’s vision of Guru Padmasambhava’s palace in heaven. Zow Palep, the chief architect of the dzong is said to have had a vision of travelling to heaven and being instructed by Guru to build a dzong similar to his palace in heaven. Monasteries such as the Taktshang (Tiger’s Nest/Den) in Paro draw equal number of tourists. The monastery is precariously located on the face of an almost vertical cliff. Guru Padmasambhava, according to legend is said to have flown on the back of a tigress from Tibet and landed in Taktshang. He had meditated at the site and later a monastery was built. Today, Buddhist lamas from Tibet and all over the world visit Taktshang to meditate. Architecture in Bhutan has deep religious significance. Dzongs serve as both centres for monastic and administrative affairs, a system of governance, described as the dual system of government. The system was promulgated by Zhabdrung Ngawang Namgyel. 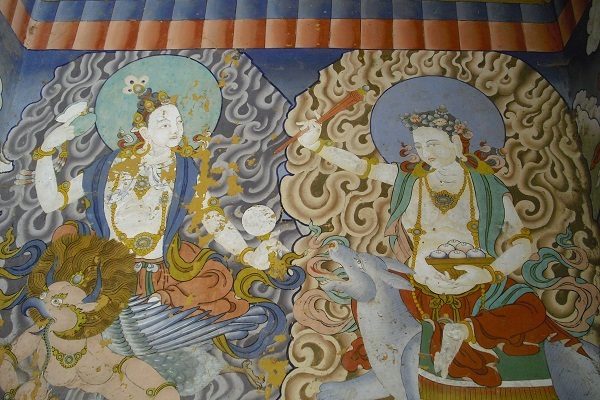 Traditional paintings drape the Bhutanese architecture including dzongs, monasteries and homes. One of the national symbols of the Kingdom of Bhutan, the Bhutanese national flag was officially adopted in 1969. The flag of Bhutan is diagonally separated in two halves: the upper left half is orange/ yellow and the lower right half is orange. In the middle of the flag is an emblem of a white dragon facing to the right.The dragon is seen holding jewels in its claws and these signify the nation’s wealth. The snarling mouth of the dragon represents the strength of the people protecting the country. 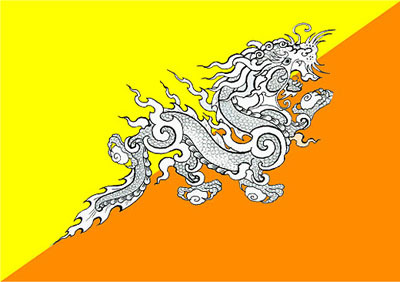 The orange color represents the Drukpas monasteries and Buddhist religion, and the orange/ yellow symbolizes the secular authority of the King.The white color stands for purity and loyalty. The national flag of Bhutan is one of the national symbols of Bhutan. The flag is based upon the tradition of the Drukpa Lineage of Tibetan Buddhism and features Druk, the Thunder Dragon of Bhutanese mythology. The basic design of the flag by Mayum Choying Wangmo Dorji dates to 1947. A version was displayed in 1949 at the signing of the Indo-Bhutan Treaty. A second version was introduced in 1956 for the visit of Druk Gyalpo Jigme Dorji Wangchuk to eastern Bhutan; it was based upon photos of its 1949 predecessor and featured a white Druk in place of the green original. 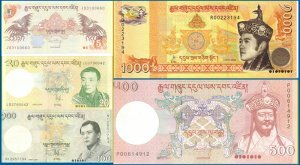 Bhutanese currency is Ngultrum (Nu.) and is officially pegged to the Indian Rupee. Also Indian Rupee is acceptable all over Bhutan except Rs 500 and Rs 1000 currency notes.Credit Cards have limited acceptability and payment through credit card is accepted mainly by Deluxe hotels and few selected Handicrafts establishments only. No vaccination is currently required for entry into Bhutan. However if you are arriving from an area infected with yellow fever, you are required to have a yellow fever vaccination. If you are arriving from Cholera infected area then officials may ask for evidence of Cholera vaccination. Anti –malarial medication is recommended for all travelers to Bhutan who are visiting rural areas in the districts that border India. Bhutanese food is generally good. Set meals for travelers tend to be on the bland side, because local food is heavily seasoned with red chilies and can be quite hot. However, more adventurous can try the local delicacies like the tasty and fiery the national dish of Bhutan, Emma Datshi which is made with chilies and Local Bhutanese cheese. Most hotels provide meals buffet-style. There are usually continental, Indian, Chinese and Bhutanese dishes. The food in hotels is often the best in town, but in main towns now there are few restaurants increasingly becoming popular. All tourist hotels have good selection of international and Bhutanese beverages. 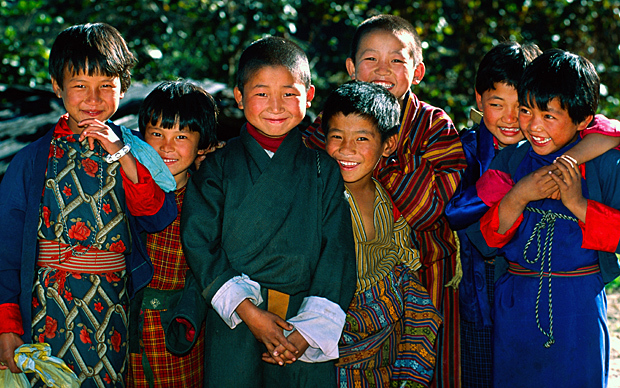 Happiness is integral to Bhutanese. Recognizing the importance of happiness over material wealth, the fourth king of Bhutan, Jigme Singye Wangchuck officially declared, happiness as an ultimate measure of a nation, rather than economic gains in the 1970s. Bhutan’s policies, plans and major government programs are all screened and happiness-tested before being implemented. The philosophical concept of GNH (Gross National Happiness) has since then taken a primary position in any government policy. The concept eventually evolved into a development model. The Gross National Happiness Commission, Bhutan’s planning commission ensured government plans included the element of happiness. The basic idea of GNH was in creating an environment where every individual is given an opportunity to be happy. Such a society could be achieved by preserving the culture, protecting the environment, and through good governance and balanced economic development: the four main pillars of GNH. Bhutan’s concept of GNH as a development philosophy can also be seen in economic concepts such as Development Economics, which rejects gross domestic product and emphasizes the importance of poverty, inequality and unemployment. Major government targets continue to be reducing the inequality gap, providing jobs and alleviating poverty. The pursuit of economic wealth in the west had proven to be troubled with economic pains, financial crises and continued degradation of the environment. Because of this, the concept has attracted a lot of interest from international economists, politicians and thinkers. After the country’s peaceful transition to democracy in 2008, happiness became the spirit of the constitution. It mandated a 60 percent coverage of the country’s forest for all the times to come. The United Nation has embraced the concept of GNH and declared 20th March as the International Happiness Day. In Bhutan, November 11th, the birth anniversary of the fourth king is celebrated on a grand scale across the country among people from all walks of life. 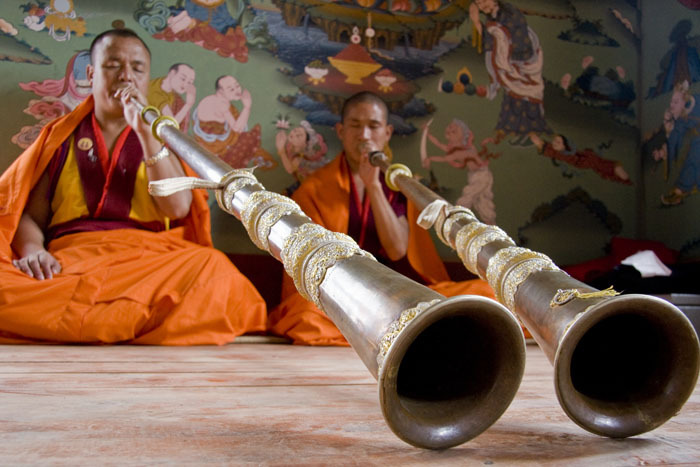 Bhutanese people follow two major religions that are similar in many beliefs and faith. Northern India was the seat of both the religions from where it spread to other parts of Asia. In Bhutan, the Northerners are mostly Buddhist while the Lhotshampas in the south follow the Hindu faith. Both Hindu and Buddhist festivals are celebrated throughout the country and the festivals see many Buddhists and Hindus celebrating together. Buddhism is the state religion in Bhutan. In ancient times, it was customary for every family to enroll one of their children in the monastic school. With the advent of modern schools, the tradition has however lost its prevalence today. Headed by the chief abbot, Je Khenpo, the monastic body in Bhutan looks after the spiritual aspect of the country. Zhabdrung Ngawang Namgyel founded the dual system of administration that includes civil and spiritual administration of the nation in the 17th century. Zhabdrung Ngawang Namgyel has been the most influential highest Buddhist spiritual leader in Bhutan. Today, every district has a dzong, forts built during the time of Zhabdrung. The dzong is the center of both spiritual and civil affairs.. The two religions have no history of conflict in the country and have peacefully co-existed with one another throughout time. Both Hindus and Buddhists believe in compassion, karma, reincarnation and rebirth.